Role of Urquhart Castle in Scotland's history and legends - from the time Urquhart Castle was first created to it's destruction - a comprehensive, yet concise and highly readable history. The Urquhart Castle stands today as ruins, silently overlooking the deep waters of Loch Ness, but these ruins have endured through some of the most turbulent periods in Scottish history. Built purposely on a convenient promontory by which to watch over the waterways of Northern Scotland and the lands of the Great Glen, Urquhart Castle has been a lynchpin in the network of great fortresses by which the people of Scotland have been alternatively protected and oppressed by whomever held the throne. Urquhart Castle sits in the Glen Mor, a large channel carved out of Scotland by the glaciers of the Ice Ages. There is evidence of human habitation in the area dating back over 4000 years. The first known fortification that was built on the site dates from at least the 6th century, as written record and radiological evidence both show a castle on that spot which St. Columba visited to start Scotland's conversion to Christianity. The story of St. Columba states that the saint landed at the top of Loch Ness and stayed with the Pictish nobles of the area, at one point having a showdown with Nessie herself to allow them to pass. The Pictish nobles were so impressed with St. Columba's fortitude and faith that they converted immediately. Radiological evidence shows that the foundations of Urquhart Castle date from around this time, and what better ringside seats for St. Columba's trials would those nobles have than the strategically perfect promontory into the Loch? 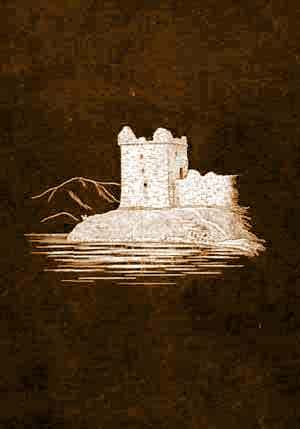 Urquhart Castle as we know it today was started by Alan Durward, the son in law of King Alexander the Second. In 1228, the locals of the Glen Mor rose up in rebellion, and the King decided that a fortification in the area was needed after the rebellion was finally put down in 1230. So, he gave his relative Alan the lordship of the area, and Lord Durward started working on the castle immediately. On March 13, 1249, King Alexander died accidentally one stormy night as he was on his way to his Queen, leaving Scotland with only a six year old princess to inherit. Margaret, the Maid of Norway, was the product of King Alexander's first marriage and had been raised in Norway since her mother's death. The nobles of Scotland got together and requested her transport from Norway to be their Queen, but she died shortly after getting sick on the trip. Edward I had planned on marrying her to his young son, and had signed several treaties to ensure the independence of Scotland in the event that the marriage went through. However, once the heirship of Scotland was in dispute, Edward quickly showed his true colors by showing up as a sovereign lord to judge the dispute instead of as a neutral party, which he had been invited as. He chose John Balliol, otherwise known as King Nobody, to serve as a vassal king, and denied the claims of the Bruces. He personally liked the Bruces much better, but was fully aware that the Bruces were a strong family who would not take the yoke of England for long. In order to undercut their power, he gave many lands and fortifications to their rivals, the Red Comyn, including Urquhart Castle in 1275 after John Balliol was forced to abdicate the kingship to Edward I. In 1297, Andrew Moray of Moray, a contemporary and compatriot of William Wallace, attempted to take Urquhart Castle in a nighttime raid, but was unfortunately repelled. Moray is the most fertile and populated district of the area overlooked by Urquhart Castle, and Andrew rose up, like William Wallace, from among the common folk who suffered the worst under Edward's oppression. Together these two men struck more blows to English power in the area than the Scottish nobles could seem to muster, but without the support of those nobles their works were to no avail. Fortunately, they finally got the support of Robert the Bruce, and his vassal Sir Alexander Forbes tried and succeeded to regain Urquhart Castle later that year. In 1303, Edward I's forces took Urquhart Castle back, and once again gave it to the Red Comyns, this time Alexander Comyn of Badenock. It may not have seemed like a brilliant move on Edward's part to give the castle to another Scots noble, but Edward was frequently forced to split his forces between Scotland and France, with whom he was also warring. The Comyn family knew that at this point, Edward was their only hope to have their claim to the Crown of Scotland recognized, as the Bruces had the support of the common people, so independence for Scotland would prove to be devastating to the Comyn family. Urquhart Castle, therefore, was one of a series of deals between the Comyn family and Edward, by which Edward thought to put down Scottish rebellion and the Comyn hoped to become the preeminent local power. In 1306, however, the hopes of the Comyn family were to be dashed forever. After several decades of constant rebellion and strife, Robert the Bruce was crowned King of an independent Scotland, and gleefully set to work clearing out his rivals. After ruining the Comyn family, King Robert gave Urquhart Castle back to the Earls of Moray, who kept it until 1346, at which point it passed back to the Scottish Crown. During the time of being a direct possession of the Crown, Urquhart Castle recieved a major renovation and refurbishment, just in time for the two centuries of conflict it was about to endure. From the end of the 1300's well into the 1400's, Urquhart Castle was repeatedly fought over by Clan MacDonald, also known as the Lords of the Isles, and the Scottish Crown, who had significant conflicts during and after the reinstatement of the Balliols. The MacDonalds had supported Robert the Bruce during his fight for Scottish independence, as they could clearly see the problems with the powerful king Edward I having sole ascendancy over Scotland, but, as was normal with the strong willed Highland and Island clans, they were ever on the lookout to increase their own holdings and independence. The weak Balliols briefly came back to the Scottish throne after the death of Robert the Bruce and the attempted ascension of his infant son David to the throne, setting the stage for even more conflict and opportunity for those nobles smart enough to take advantage of it. The Lords of the Isles were a largely independent group that consisted of a hybrid between Scottish and Norse settlers fleeing the various wars and conquests of their homelands, and who had always been very independent in their dealings with both Scotland and Norway, so they used the Balliol/Bruce conflict to their advantage. This conflict repeatedly devastated the area, causing the local populace much hardship as the nobles who were supposed to protect them fought over lands and titles. However, eventually the power of the Mac Donalds waned and the Grants of Frenchie peaceably administered the castle and lands in service to the Gordons of Huntly. In the early 1500's the MacDonalds made a brief comeback and besieged the castle twice, both time decimating the populace of the Glen, eventually leading to Urquhart Castle's abandonment to the people of the Glen in the 1600's. This particular comeback was due in large part to foolishness on the MacDonalds' part and a powerful English king who pushed all the nobles of Scotland to the point of desperation or surrender. After Urquhart Castle was abandoned, the populace of the Glen started taking pieces from the outer wall to build or strengthen their own homes against the harsh winters of the area. Finally in 1689, one Captain Grant and 300 Highland warriors saw off a force of King James' supporters. They held the garrison there until 1692, at which point the Castle was blown up by the English to prevent it being used thereafter by the Jacobites, which was the political group responsible for the continued attempts for an independent Scottish Crown. Unfortunately, they were to never be entirely successful. So, there the ruins of proud Urquhart Castle stand today, looking out over the waters of the quiet Loch, a mute testimony to almost twelve centuries of Scottish rule and rivalry. Today, they are a landmark for both the people of the nearby village of Drumnadrochit and for the many Scottish descendants worldwide who still find pride and identity in the struggles, victories, and losses of their ancient home. Major write by L Ice, rewrites by Donald Urquhart, 2008. Copyright, all rights reserved, on all contents on this web site.